Thank you for the asparagus advice. I think that this would also be a delicious salad as well. I look forward to giving this a shot, though I would have thought that the extra bay would make the asparagus bitter. I will try this the next time I have some asparagus. I would have thought the same about the bay but it works well. Maybe the cooking time is short enough that it keeps things mild . . . . 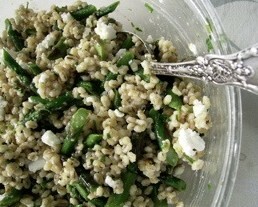 I made an orzo salad tonight with pesto from the recipe made with kale and some grilled asparagus and mozzarella. Absolutely delicious! I can just see Brian’s face when you served the barley dish. Asparagus risotto is our favorite spring dish! I do add lemon juice and some zest also which I think just finishes it perfectly. Have fun at your class! 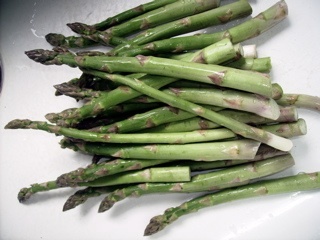 Speaking of asparagus and simple, have you tried braising asparagus in a covered skillet with butter and just a little water? Then at the end you throw in parmigiano. It melts and coats the spears. Good for you for admitting to a disappointing experiment, and learning from it so thoughtfully! I’ll try it Kelly. Haven’t ever done exactly that. thanks!